The New Moon in Sagittarius arrives at the close of 2017, a few days before the Capricorn Solstice and the peak time of darkness in the northern hemisphere and peak time of light in the southern hemisphere. The threshold we cross at the New Moon also involves the end of two different cycles of Saturn: the end of Saturn’s cycle over the past year with the Sun, as well as the end of Saturn’s journey over the past three years through the sign of Sagittarius. On December 19 Saturn will enter Capricorn, and on December 21 we will experience the amazing alignment of Saturn entering the heart of the Sun and beginning a new synodic cycle on the same day as the Solstice. The visionary significations of Sagittarius are amplified at the New Moon as Mercury, Venus, Saturn, and the Sun and Moon are all co-present in the sign of the Centaur; and yet, there is a tension at play between the expansive thrust of Sagittarius and the impending shift into the condensed, disciplined, and persevering qualities of Capricorn that will dominate the coming lunar cycle. Mercury is a vital player to listen to within the final symphonic movement of Saturn’s time in Sagittarius we are experiencing at the New Moon. We are at the final stage of Mercury retrograde in Sagittarius, as Mercury will station direct at the same time as the Capricorn Solstice and the union of the Sun and Saturn in the sign of the Sea Goat. Mercury is orbiting in between our Earth and our Sun and similarly the presence of Hermes will demand our attention as Mercury stands still (from zodiac perspective) in a catalyzing aspect with Neptune in the week following the New Moon. Mercury calls us to descend into our inner darkness and reflect upon how are beliefs about life are interfacing with our actual experience of life. The New Moon calls for an uncompromising assessment of what has been happening for us in the material world rather than what we wish would be happening in imaginal space. Mercury offers the gift of shifting perspectives and beliefs to better align with the hard work and determined problem solving that will be needed in the coming season. Adding creative fire to the lunation is the harmonious trine formed between Uranus in Aries with the Sagittarius New Moon, with Venus in Sagittarius closely applying to a trine with Uranus. The asteroid Pallas Athene is also united with Uranus in Aries, and the mythic significations of Athene such as far ranging vision and strategy are available to engage with in figuring out needed course corrections. Uranus can bring unexpected events but also opens fields of perception to simultaneously remember our past as well as liberate ourselves from whatever has kept us stuck in limiting patterns of thought. If we can align our hopes and desires for our future with grounding in the needed work of daily life, the trine between Uranus and the New Moon can facilitate breaking free of stagnant habits and the birth of presence needed to make real the type of “new year resolutions” traditionally made at the threshold between calendar years. With regard to the coming shift of Saturn into Capricorn, the darkness of the New Moon invites rumination over the past three years since Saturn entered Sagittarius on 23 December 2014, enabling us to be prepared and ready for what is to come with the shift of Saturn into Capricorn. In the coming season of amplified Capricorn atmosphere, we will have opportunities to make strides in building structures to support our core desires and visions. Yet to reach the potential of Saturn in Capricorn we will also need to let go of the elements of our life that have been needlessly dissipating energy and resources so we can be as efficient and direct as possible in action. Jupiter in Scorpio rules the Sagittarius New Moon and is in the middle of two pivotal aspects with Mars in Scorpio as well as the transiting lunar nodes. Since Jupiter is in the home of Mars, Mars being at home in Scorpio bolsters and supports Jupiter and makes our experience of Jupiter as intensely Scorpio as possible. There is tenacious determination available in pursuit of goals and greater support for persevering through whatever obstacles are in the way of desired outcomes. Yet the square between Jupiter and the transiting lunar nodes creates the climate of a crossroads on both personal and collective levels. Accountability is being demanded, as well as a piercing analysis into how we have been conducting ourselves in pursuit of desires. Mars in Scorpio at its highest expression is a fierce protector who will unconditionally devote itself to guarding the vulnerable, while Jupiter in Scorpio adds amplified intuition and the capacity to transcend former limitations. With the transiting North Node of the Moon in Leo and the transiting South Node of the Moon in Aquarius, it is necessary at the Sagittarius New Moon to penetrate into how we have been conditioned by surrounding culture and realize how this has influenced our values and desires. It is a perfect time to reflect upon what aspects of our beliefs and goals have had more to do with fitting in with group dynamics and societal norms more so than how we can truly manifest our gifts in service to what our surrounding community actually needs. Jupiter in Scorpio is demanding exploration of difficult questions and uncomfortable answers about our collective culture; on personal levels we have the opportunity for purification and release of past influences while embodying deeper integrity aligned with the core values that stand up to the test. The trine between Neptune in Pisces with Jupiter in Scorpio can help with feelings of disillusionment regarding the surrounding world so that we can form a vision of life that is simultaneously inspirational as well as more realistic and grounded. Instead of trying to escape reality or distract ourselves in denial, we have the opportunity in the coming lunar cycle to take practical steps toward helping to create the type of world we want to live within. At the same time, the challenging square formed between Chiron in Pisces with the Sagittarius New Moon signifies the indescribable pain that can be felt through witnessing both the suffering of the world and the lack of appropriate response by power structures. Within the coming influence of Saturn in Capricorn in the year ahead, we will need to take the responsibility to protect and nurture rather than expect it to come from outside sources. After Saturn enters Capricorn as the Moon waxes full, both Mars and Saturn will be at home in their own signs, strengthening the resolve to bring about the significations of Saturn and Mars in our life. As a result the coming lunar cycle will be more about perseverance than normal, enduring challenges while striving for whatever we need to make happen for ourselves or others. As the Moon builds with light into the coming Cancer Full Moon on January 1, Mars will move within three degrees of an applying conjunction with Jupiter as well as a square to the lunar nodes. We can expect the collective atmosphere of heated conflict to not only continue but intensify, and so within the tumult we will need to make careful choices and decisions so we will be aligned with the highest good. The Sagittarius New Moon falls in the third decan of Sagittarius associated with the 10 of Wands card illustrated by Pamela Colman Smith above. Human toil, endurance and perseverance are some of the immediate associations evoked by the image of determination, and so there is strong alignment between the 10 of Wands with the astrological atmosphere of the New Moon. In tarot this card has been associated with oppressive dynamics and limitations, and in fact is called Oppression in the Thoth deck. Fittingly, the third decan of Sagittarius is ruled by Saturn, a planet that involves the type of oppressive circumstances that force us to cultivate endurance and new structures of support. Austin Coppock ascribed the image of “A Horse’s Skull” to the third face of Sagittarius in his book 36 Faces, describing how it reveals the unification of mind, body, and spirit through committed work and effort yoked to a goal. Coppock also wrote that the final face of Sagittarius brings a reckoning regarding whatever needs to be sacrificed in pursuit of desires, noting that “those who walk this face must choose which burdens they will bear to the bitter end, and which are not worthy of such feats of will and endurance.” Coppock also noted the influence of the primordial goddess Ananke over this decan, as the Hellenistic text The 36 Airs of the Zodiac proclaimed the presence of the goddess of Necessity here. While we have a range of choices to choose from in response to what is arising in our life at the Sagittarius New Moon, there is also the necessity of what we have to face due to being here amongst all of the challenges brought about by the period of world history we find ourselves within. Since Saturn is present within the third decan of Sagittarius at the New Moon, the forces of Necessity unleashed by the third face of Sagittarius will be on full display. Cultivating inner fire and bringing inspired effort into our daily grind not only will help us achieve personal goals but will also model the needed passion that can bring hope to others in the doldrums of despair. As we leave the fiery, outwardly directed energy of 2017 we enter the year of 2018 that has more of an emphasis on the inwardly directed elements of earth and water. Allow the darkness of the Sagittarius New Moon to open you to the level of soul searching needed to face all of the demands coming in the season ahead. The New Moon in Sagittarius on November 29 weaves transitions between the astrological dynamics that have dominated 2016 and the coming themes of 2017. The New Moon is square to both Neptune and the transiting lunar nodes, in the same degrees of Sagittarius that Mars previously stationed retrograde in April 2016. The Sagittarius New Moon also forms a square to the Solar Eclipse in Virgo that occurred in September 2016, and the Solar Eclipse in Pisces that will occur in February 2017. The blackness of the Sagittarius Moon draws us inward to accept the circumstances of our life and everything that has correspondingly been stirred up from within during this past year. Many unexpected things have happened during a year of incredible mutable activation in astrology, and as we let go of what we had expected and open to what has now arisen, a new perspective will begin to coalesce and clarify the meaning of all the changes that have come about in 2016 so far. The intuitive capacities inherent in Sagittarius support witnessing and observing all of our inner feelings and coming to a sense of fresh vision and meaning that will bring inspiration in the coming months. There is a whirlwind of transpersonal, outer planet activation in tandem with the Sagittarius New Moon that makes exploration of our unconscious and everything we have been keeping out of conscious awareness imperative. The New Moon in Sagittarius is ruled by Jupiter in Libra as Jupiter has initiated its first square with Pluto in Capricorn and is en route to form an opposition with Uranus in Aries. Jupiter in Libra is also in trine with Mars in Aquarius, and both Mars and Jupiter are in sextile with Saturn in Sagittarius. These are incredibly potent and catalyzing surrounding transits for Jupiter that not only taps Jupiter into subconscious motivations and soulful desires, but also presents Jupiter with harmonious aspects to ground and manifest vision into tangible projects and results. These aspects support opening awareness and communication, being willing to accept nonlinear perceptions and insights that transcend the normal confines we limit our consciousness to. Instead of merely projecting the contents of our psyche being activated, it will be helpful to sit with, embrace and live with all of our desires, taking the responsibility to be accountable for our own feelings. There is potent power available within these transits that can be utilized to bring one’s creative gifts into the surrounding world as well as support and protect the livelihood of others we care about. The New Moon in Sagittarius is conjoining the royal star Antares, known as the Heart of the Scorpion. Antares has been a vital astrological factor in 2016, as Mars stationed retrograde at the same degree as Antares in April 2016, and in August 2016 both Mars and Saturn conjoined in our night sky near Antares. In combination with the recent Full Moon in Taurus that was aligned with the degrees of Scorpio that Mars stationed direct in June 2016, the transition from the previous Taurus Full Moon into the Sagittarius New Moon has reawakened the meaning of the Mars retrograde of 2016 that was aligned with Antares, introducing important new information and events that reshape what we have learned from our experience. Antares brings an intensity that will make the lessons we need to accept and learn from impossible to resist at this New Moon. 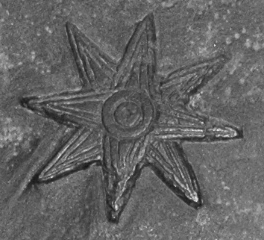 Bernadette Brady in her book on fixed stars wrote that Antares was associated with Yima (aka Yama), the god of the dead, by the Persians. Correspondingly, Brady wrote that Antares naturally catalyzes purification through “a cleansing life-and-death experience,” and evokes desire to seek the deepest depths of intensity in life. The Sagittarius New Moon aligned with Antares opens potential to purge and burn off past issues and complexes that have been weighing us down over the course of the past year. Feeling within our body and inner recesses, there is healing to be found in receiving the truth of what life is now offering us instead of struggling to change what has already come to pass. The asteroid Juno is also conjoining Antares and the Sagittarius New Moon, signifying that important realizations are available through our relationships into what we need and want in the relationships we make lasting commitments within. Antares has had a long association with Mars and Jupiter in astrology going back to the time of Ptolemy, and has also been associated with a fierce fighting spirit. All four of the Royal Stars of Persia warn against hubris, and in Antares the downfall traditionally has been seen as obstinate attachment to headstrong martial force that leads ultimately to unnecessary destruction. Yet since Antares also signifies strong mental sharpness and strategizing, the resiliently tough correspondences of Antares can also be used to strengthen the resolve of one’s inner warrior, as long as consideration is taken to not be overly self righteous, stubborn, and egotistical. Venus in Capricorn takes center stage at the Sagittarius New Moon, tightly applying to a square with Uranus after having initiated a new phase with Pluto during the waning of the Moon that led into the New Moon. Venus in Capricorn formed a conjunction with Pluto at the same time that Jupiter in Libra formed a square with Pluto, dredging up deep relational patterns while uncovering liberating insights regarding what we want and need in relationship. To fully embody and realize the meaning from contact between Venus and Uranus, we need to allow ourselves to become catalyzed by contact within our relationships as well as create space for ourselves to observe what has been stirred up within in order to receive the corresponding inner knowing. There is support within all of the surrounding astrological transits to expand the parameters of Venus in our life, not only gaining awareness for what we value and what will bring us pleasure, but also sensing how we can move beyond previous limitations to find outlets for its expression and manifestation. With Uranus impacting Venus so strongly, there is an unexpected quality in which we will discover Venusian meaning from unlikely sources. Instead of judging where our sense of Venus is coming from, be open to embrace the message because there is likely to be a significant unconscious quality that had been previously barred from conscious awareness. As the Moon begins to wax at the initial stages of the forthcoming lunation cycle, it will pass over a conjunction with Saturn in Sagittarius. Each subsequent day the Sun will get closer and closer to a conjunction with Saturn, eventually forming a conjunction on December 10. The Sun will form a square to Neptune the day after the New Moon, and so the Sagittarius New Moon re-activates the square between Neptune and Saturn that has been a dominant theme of 2016. While there has been extraordinary disillusionment on collective and personal levels in correlation with the square between Neptune and Saturn, the resulting dissolving and dislodging of formerly solid structures is opening new pathways and potentials with which to reorient and restructure. The Sagittarius New Moon is best utilized by honestly accepting our present circumstances and allowing ourselves to observe and learn from what the present moment of our life story is teaching us. Being in denial will be even more toxic than normal at this New Moon. The Sagittarius Sun approaching Saturn is an opportunity to make a thorough review of our life and what is working well versus what needs modification. Aiding an ability to grasp a far reaching overview of our present circumstances is Mercury in Sagittarius having recently separated from a trine with Uranus and Ceres in Aries at the New Moon. The first face of Sagittarius holds the New Moon and is associated with the 8 of Wands card illustrated above by Pamela Colman Smith. The 8 of Wands card contains an abstract image of velocity found in angularly jutting wands, and the associated meaning of the card involves the speed of thought and imagination applied to a passionate goal. 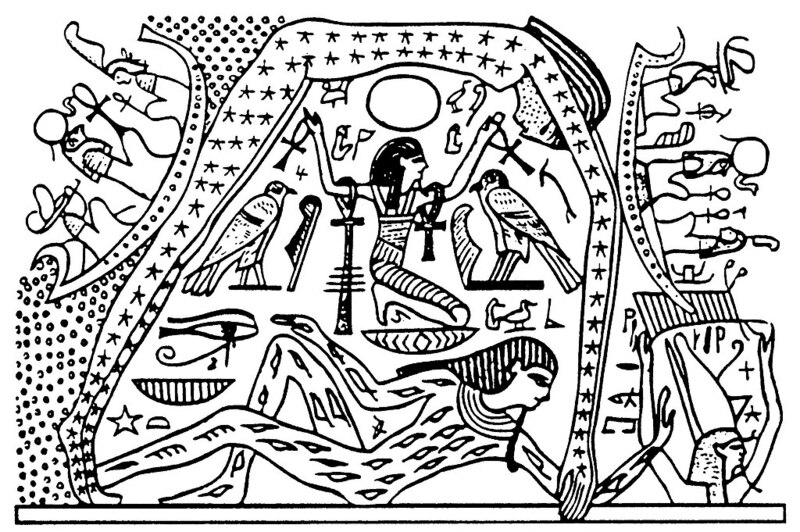 Austin Coppock in his book on the decans 36 Faces ascribed the image of “The Poisoned Arrow” to the first face of Sagittarius, writing that “the essence of this decan entails the swift emergence of a motivating vision and the attainment of a vehicle to move one toward the pictured goal,” as the “fire that enters the mind enflames it, purging the grosser levels of being as it descends” (p. 193-4). 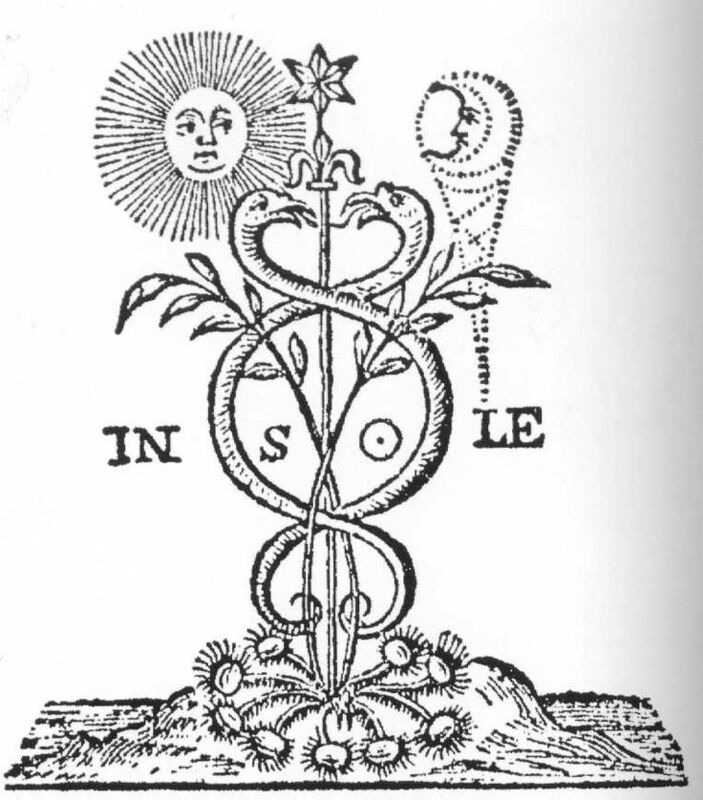 Coppock wrote that the Moon in the first decan of Sagittarius desires a philosophical and spiritual quest that will bring personal meaning, and accordingly requires goals and targets that will unify energy in alignment with one’s vision for life. Fittingly, the first face of Sagittarius is ruled by Mercury, signifying its rapid pace. During the coming lunation cycle Mercury will become one of the most significant astrological factors, as Mercury will enter Capricorn and approach a conjunction with Pluto before stationing retrograde on December 19. Until then, Mercury will be available as a discerning Evening Star capable of digesting meaning from the experiences of each day. Evening Star Mercury in Sagittarius and Capricorn will be able to perceive insights from within our bodies, our dreams, and by grounding our perception into the surrounding forms of our material world, synthesizing important realization. As Mercury slows down to a standstill as it approaches Pluto, our perception will be able to delve into the depths of our desires, and yet whatever careful plans we have made will need to become open to the shifting that Mercury retrograde brings. Align intention at the New Moon in Sagittarius with whatever brings you the greatest meaning in life, with understanding that the coming lunar cycle will be bringing numerous unexpected events and experiences not capable of being planned for at the moment.